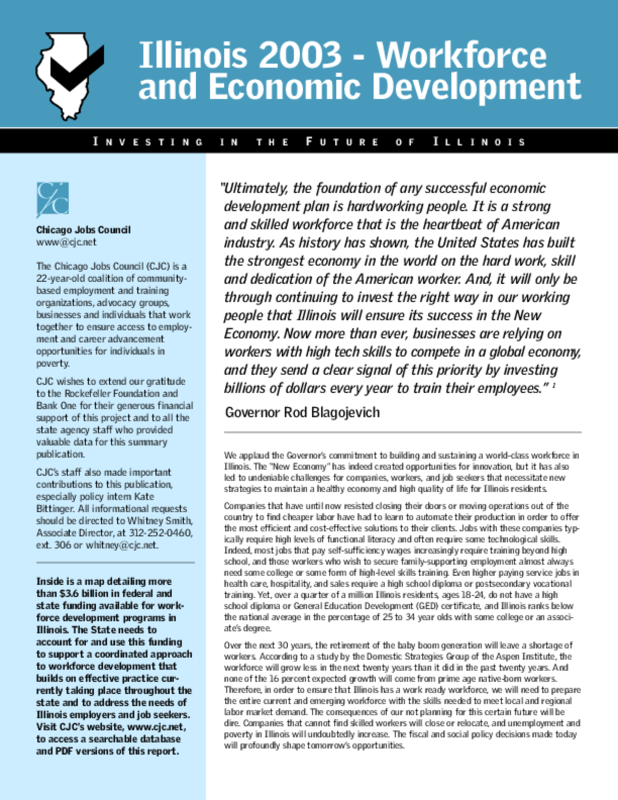 The Chicago Jobs Council embarked upon this project -- aimed at documenting federal and state workforce development funding available in Illinois -- to assist policymakers and other stakeholders in making strategic investments to meet the needs of Illinois' job seekers, workers, and businesses, and ultimately to help achieve Governor Blagojevich's vision of ensuring Illinois'success in a New Economy. The inside funding streams map represents a snapshot of the workforce development funding that was available for Illinois' workforce in FY02. Due to federal and state budget realities,some of the appropriations amounts listed have been reduced, and changes in political leadership have resulted in some administrative and program changes. Overall, the map is a good reflection of Illinois' workforce development system today. The Chicago Jobs Council believes that workforce development funding should be charted on an annual basis - using this map as a framework - to help manage decisions about how to invest program dollars and fill program gaps for the neediest job seekers. The following list of the key elements needed to build a flexible and skilled workforce in Illinois was developed using the insight and the extensive experiences of CJC members in providing workforce services and evaluating workforce programs.